Justise Winslow has been gaining draft hype with an exceptionally strong NCAA performance, and I’m here to dump gasoline on the fire. Both players tended to hold steady or slightly downtick with fewer weak opponents to feast upon. There is no obvious progression for either, which highlights how awesome Justise’s leap has been. It also suggests that the uptick in team success is largely due to his growth into a star. It may seem overreactive to throw him into the top 3 discussion based on three great tournament games, but really this is an extension of a trend that has been ongoing for half a season now. Not only have his statistics been trending off the charts, but he looks like a beast while accruing them. 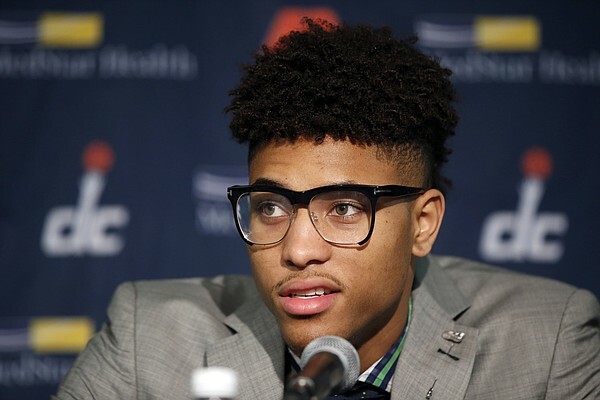 The plays he makes on both ends in transition, on the glass, and in attacking the rim are plays that no NCAA player other than Kelly Oubre on a good day is physically capable of making. His physical profile is stellar with solid height (6’7″) and length (6’10”) and exceptional strength and athleticism, and if he continues to improve his ball handling and shot making there is not much impeding his upside. At this point Winslow is at worst the 4th best prospect in the draft, and it would be nothing short of lunacy to take Emmanuel Mudiay ahead of him. Winslow’s physical tools are just as good as Mudiay’s, except he has dominated top end NCAA competition whereas Mudiay has played well in a league where 38 year old Stephon Marbury reigns supreme. It is highly unlikely that Mudiay would be notably better at the NCAA level, but possible that he would be drastically worse, so it is correct to value Winslow above him. Winslow is still no threat to Towns at the #1 slot, but it is perfectly reasonable to take him at #2 or #3 overall. It may seem like insanity to value the 22 PER player over his 31 PER teammate who was the #1 RSCI prospect and has been the consensus #1 pick all season, but Winslow’s skill set is far more valuable at the NBA level. Jahlil Okafor is a stud low post scorer, but it comes at the expense of the neither 3 nor D stigma. This makes him difficult to build around since there are few stretch 4’s who are good enough to atone for Okafor’s rim protection shortcomings and pairing him with a rim protecting 5 prevents him from having optimal spacing to operate in the paint with maximum efficiency. I can see him becoming a more efficient version of Zach Randolph, which is certainly a valuable NBA player which is why I maintain him as a top 4 pick. But Zach Randolph was not considered good until paired with Marc Gasol who 1) is a good defensive center and 2) can make long 2’s and is a great passer from the high post. Even if he hits his upside, Okafor still needs to be paired with a fellow big with a unique blend of strengths to play a big role on a contender. Also his FT% looms as a major wart, as it bodes ill for his ability to operate outside the paint offensively. If nothing else hurts his overall efficiency which is his principal selling point as a prospect. In short, Okafor’s hype is based largely on scouts overrating the value of low post scoring, especially when it comes with neither rim protection nor outside shooting. While he has been as good as advertised, that is not good enough to be a top 3 pick in this class when he is such an awkward fit in the modern NBA. This explains why the gap between Okafor (9.6) and Winslow (7.3) according to Layne Vashro’s EWP model was surprisingly slim entering the NCAA tournament. That gap should narrow given that Winslow has outshined Okafor thus far in the tourney. Further, if any player is underrated by EWP it is Winslow since he is far more athletic and has a significantly stronger split over the second half of the season. So according to math and logic and such, Okafor is at best is a narrowly superior prospect to Winslow. My gut feeling is that Winslow is a more valuable prospect that will become a more valuable pro. He is the player that I tune in to watch, he is the player with the killer physical profile, and he is the player that I would dream of building an NBA team around if he hits his upside. I am unsure whether I take Winslow over Russell. I currently lean gently in the direction of D’Angelo, but Justise still has a game or two to change my mind. But more importantly, while watching the Final Four everybody should ask themselves: would you really be upset if you rooted for a team that picked Winslow over Okafor?